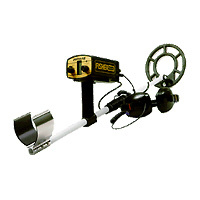 I recently purchased a pulse headhunter detector to use in the carribean on vacation to hunt for rings and coins. I live in colorado and won't be going on vacation for a couple of months. I took the detector to a nearby park where they have sand around the playground equipment. I found a penny at 7 inches and a 3 inch long nail at 13 inches. I planted a ladies gold ring at 6 inches and received good tone, a man's gold wedding band at 10 inches and a nickel at 13 inches. These gave good hard repeatable tones, something you would definately dig. I couldn't get good hard repeatable tones deeper than these depths. I was very impressed with this detector and the depths it gets. I have been detecting for about 14 years and have owned 8 other detectors. I am posting this review because i couldn't find very much information on this machine before i purchased it. This is my first Fisher detector. When I decided to get this detector it was because I heard it had good depth. When my wife and I go out detecting, it's usually Friday till Sunday, and the ability of Fisher to work on 8 AA batteries for 6 months is outstanding, plus to change them is simple. Some detectors you have to plug in every night to get a hunt out of them. It's a non-motion detector, which I like. I would not recommend this unit for a beginner water-hunter because unlike other detectors, you must have three arms to operate this unit. One for your scoop, one for holding the detector, and the other for continually adjusting the detector "sensitivity" knob. Using it at the beginning was hard and the threshold was annoying. It took me some time to get used to it. It is the same in fresh and salt water. As soon as you take a step deeper, the threshold changes so you have to walk in a straight line parallel to the shore. It works in wet sand but you get better depth in the water. I would suggest to the manufacturer that the sensitivity knob should either be made a bit tighter cause even a light touch will change the sensitivity. I had to take the knob off and wrap a rubber band around the pin. Overall I have had very good luck with the Impulse. I would estimate the depth on a medium size gold ring to be about 18 to 24 inches. I have dug some pretty deep holes. If Fisher could make the threshold stable, with the same depth, performance and the same price tag, I 'll be the first in line. I normally don't carry a measuring tape with me, but my non scientific guess would be, I could get a 12-14 inches on a US quarter when there is no wind and the water is calm using a 10 inch coil.